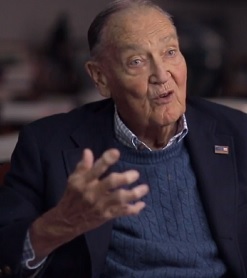 We’ll always remember Bogle for the courage he demonstrated on April 23, 2013 when he appeared on the PBS program Frontline. Bogle dropped the bombshell that Wall Street has attempted to hide for half a century: If you work for 50 years and receive the typical long-term return of 7 percent on your 401(k) plan and your fees are 2 percent, almost two-thirds of your account will go to Wall Street. Bogle: What happens in the fund business is the magic of compound returns is overwhelmed by the tyranny of compounding costs. It’s a mathematical fact. There’s no getting around it. The fact that we don’t look at it— too bad for us. Smith: What I have a hard time understanding is that 2 percent fee that I might pay to an actively managed mutual fund is going to really have a great impact on my future retirement savings. Bogle: Well, you have to rely on somebody to get out a compound interest table and look at the impact over an investment lifetime. Do you really want to invest in a system where you put up 100 percent of the capital, you the mutual fund shareholder, you take 100 percent of the risk and you get 30 percent of the return? You can check the math yourself. Access a compounding calculator on line. Input an account with a $100,000 balance and compound it at 7 percent for 50 years. That gives you a balance of $3,278,041.36. Now change the calculation to a 5 percent return (reduced by the 2 percent annual fee) for the same $100,000 over the same 50 years. That delivers a return of $1,211,938.32. That’s a difference of $2,066,103.04 – the same 63 percent reduction in value that Smith’s example showed. If you don’t know the amount of fees that you’re paying on the mutual funds in your 401(k) plan, 403(b) plan, IRA or other retirement vehicle, you may be putting your ability to retire with adequate income and dignity at risk.